Sodium bicarbonate reduces stomach acid. It is used as an antacid to treat heartburn, indigestion, and upset stomach. Sodium bicarbonate is a very quick-acting antacid. It should be used only for temporary relief. If you need to treat long-term stomach acid problems (such as peptic ulcer disease, GERD), talk with your doctor about other medications. Sodium bicarbonate is the active ingredient in baking soda. Take this medication by mouth, usually every 4 hours as needed or as directed by your doctor. Some tablets should be dissolved in a glass of water before swallowing. Other tablets may be swallowed whole or dissolved in water before swallowing. Follow all directions on the product package for the product you are taking. If you have any questions, ask your doctor or pharmacist. If you are self-treating and your acid problems last or get worse after you have used this product for 2 weeks, or if you think you may have a serious medical problem, get medical help right away. If you are using this medication regularly on a daily basis for more than 2 weeks, you may have a medical problem that needs different treatment. Ask your doctor if this is the right medication for you. If your doctor has directed you to take this medication for acidosis or to alkalinize your urine, your dosage is based on your medical condition and response to treatment. To get the most benefit from this medication, take it regularly, exactly as directed. It is usually taken by mouth several times a day. To help you remember, take it at the same times each day. Do not increase the dose, take it more often, or continue taking this for longer than prescribed. What conditions does Sodium Bicarbonate treat? Nausea, bloating, or gas may occur. If any of these effects last or get worse, tell your doctor or pharmacist promptly. Tell your doctor right away if you have any serious side effects, including: swelling hands/ankles/feet, unusual weight gain. When taken with sodium bicarbonate, large doses of calcium from your diet, medications, or supplements can rarely cause a serious problem called milk-alkali syndrome. Ask your doctor or pharmacist about using calcium products safely while you are using this medication. Tell your doctor right away if you have any serious side effects, including: dizziness, muscle aches/spasms, mental/mood changes (such as confusion, irritability, memory problems), vomiting, weakness, signs of kidney problems (such as change in the amount of urine). Get medical help right away if you have any very serious side effects, including: chest pain, seizures. List Sodium Bicarbonate side effects by likelihood and severity. Before taking sodium bicarbonate, tell your doctor or pharmacist if you are allergic to it; or if you have any other allergies. This product may contain inactive ingredients, which can cause allergic reactions or other problems. Talk to your pharmacist for more details. 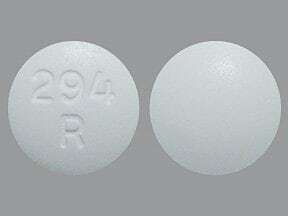 Before using this medication, tell your doctor or pharmacist your medical history, especially of: kidney problems, heart failure, low calcium levels, swollen ankles/legs/feet due to retaining water (peripheral edema). Because this medication contains salt (sodium), do not use it if you are on a salt-restricted diet. During pregnancy, this medication should be used only when clearly needed. 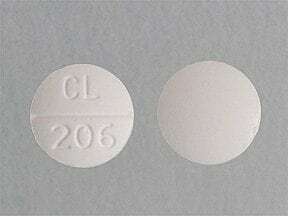 This medication may worsen high blood pressure during pregnancy. Discuss the risks and benefits with your doctor. What should I know regarding pregnancy, nursing and administering Sodium Bicarbonate to children or the elderly? Some products that may interact with this drug are: acetazolamide, aspirin and other salicylates (such as salsalate), corticosteroids (such as prednisone), memantine, medications with a special coating to protect the stomach (enteric coating). This medication can decrease the effectiveness of certain drugs that need stomach acid to work, including ampicillin, atazanavir, certain azole antifungals (such as ketoconazole, itraconazole), iron supplements, pazopanib, sucralfate, among others. Before using this medication, ask your doctor or pharmacist how to manage this possible interaction. Does Sodium Bicarbonate interact with other medications? Lab and/or medical tests (such as calcium/potassium/sodium levels, bicarbonate levels) should be done if you are taking large doses or taking this medication for more than 2 weeks. Keep all medical and lab appointments. Consult your doctor for more details. 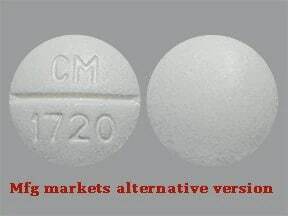 This medicine is a white, round, scored, tablet imprinted with "CM 1720". 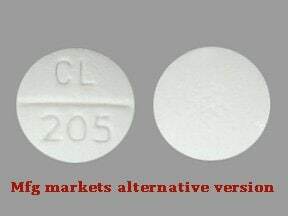 This medicine is a white, round, scored, tablet imprinted with "CL 205". 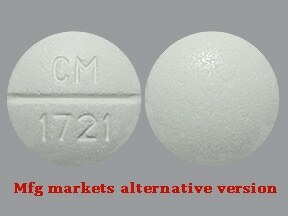 This medicine is a white, round, scored, tablet imprinted with "CM 1721". 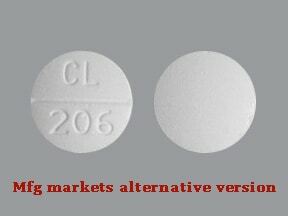 This medicine is a white, round, scored, tablet imprinted with "CL 206". 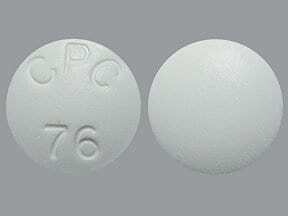 This medicine is a white, round, tablet imprinted with "CPC 76". 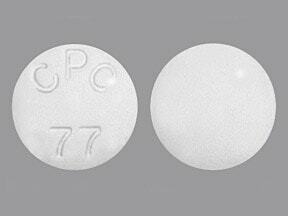 This medicine is a white, round, tablet imprinted with "CPC 77". This medicine is a white, round, tablet imprinted with "294 R". Have you ever purchased Sodium Bicarbonate?